There’s a movie that my husband and I love to watch. 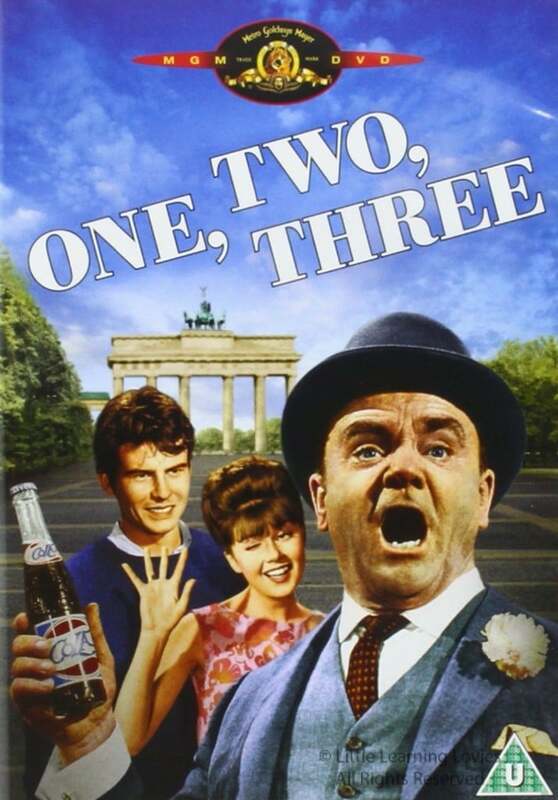 It’s called “1 2 3” and it stars James Cagney as a rep for Coca-Cola. He’s stationed in communist Russia. His boss sends his daughter to stay with him for a while but she’s quite an adventurous soul who ends up falling in love with, well, a very communist Russian named Otto. This bosses daughter owns two fur coats, one of which she gives to the housekeeper half way through the movie. Why? Because Otto says that no woman should own two fur coats until all the women in the world own one fur coat. If you haven’t seen the movie, I highly recommend it. It does a great job of poking fun at a rather serious time in history and illustrating some of the problems with communism. I didn’t bring the movie up to get into any political debates, but I do want to point out that America is not built on communism. 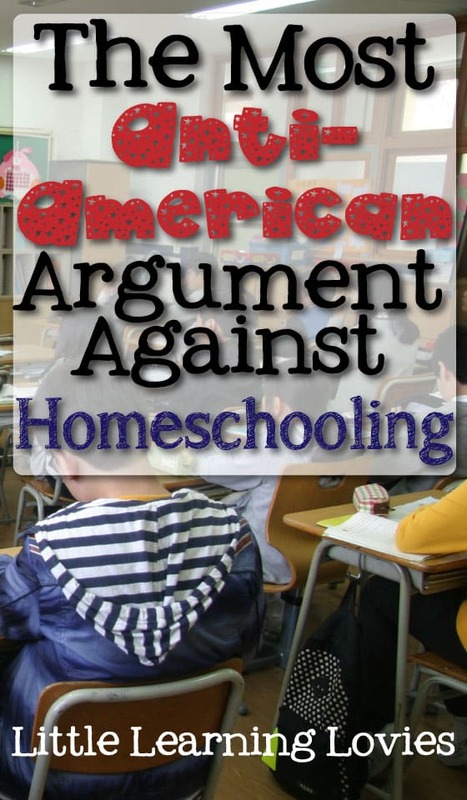 And doesn’t this argument against homeschooling sound an awful lot like the fur coat argument? No group of children should be allowed to have an amazing education until ALL the children can have a nearly adequate education. By this logic, there should be no private schools. There should be no magnet schools. There should be no way at all for parents to remove their children from the basic public school and no way for anyone to work hard to better themselves. Even within the school system, how can we justify special advanced classes? Doesn’t pulling a gifted child from the rest of the group deprive the other children from the benefits of learning with the gifted child? And what about special remedial classes for children who are falling behind? Certainly those children are being deprived of the benefits of learning with children more advanced than they? I Don’t Feel Guilty… Do you? I don’t feel guilty that our family has the luxury of two cars in the driveway while a neighbor down the street has only one and I don’t feel that my choice to homeschool is negatively impacting the public schooled children on our street. In fact, I believe we have a positive impact on them because they like to come to our house and read now. (They thought my kids were totally crazy when we first moved here but we’re slowly winning them over). They like to come experience our science lessons and play Revolutionary War in the back yard. I just can’t figure out how removing my family from the public education system has any negative impact on that system. My husband and I are raising some amazing kids who are free-thinking, creative, self-starters. I don’t have any fear for their adult life because I know they’ll be able to make whatever situation they land in work. I know they’ll find a way through it all. While I DO think our public education system needs some drastic change, I really don’t believe that sticking my own children into an environment where they are asked to try to thrive despite the issues and obstacles would do any good for anyone. To be clear, I don’t think that we should get rid of public school. I don’t think that every family should homeschool. I DO think that as Americans, we have the right to choose what is best for our families. We have the right to NOT submit to the will of the collective. We have that right because we are Americans. We are free. If public education is something you feel strongly about, you have the right to work towards positive changes there. That doesn’t mean that I have to put my energies there. American education means being free to better yourself. It means finding opportunities and making the most of them. 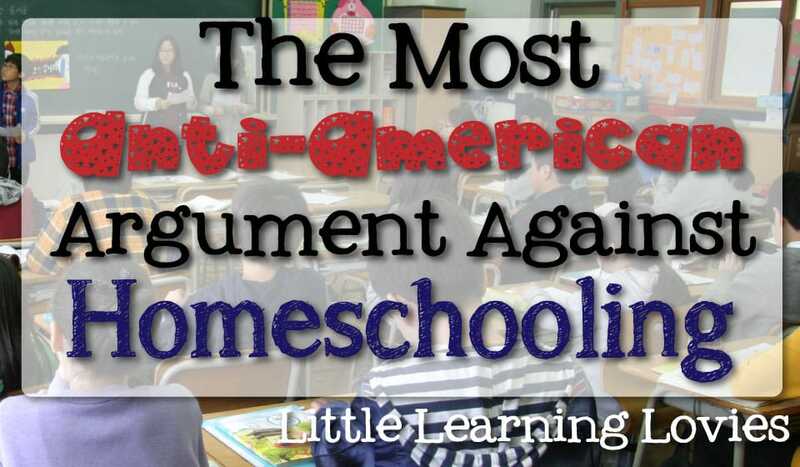 For my family, we choose the opportunity to homeschool. That’s our solution for our family. I think it’s a specious argument. What they really won’t say is that the “good” students are the ones who have involved parents to support and encourage them. The parents who volunteer, who help the teacher, these are the value-added families who give back to the schools. Studies show – http://www.nea.org/tools/17360.htm – parental involvement is a primary indicator of achievement. Theoretically, these involved families are the ones lost to homeschooling. Trust me, as one of the “good” students who was always forced to work with a “bad” student to help them, *I* wasn’t doing a lick of good. I really didn’t like being forced to help, and probably made those kids feel awful. Now my mom, who was super-involved in the classroom, in PTA, in fundraising, she was valuable. I just don’t think the argument is genuine. If a student was smart enough to elevate the level of learning, they were usually ostracized as a “nerd,” and quickly learned to keep their mouth shut. However, even if valuable, neither students nor parents generally are able to effect change. It’s a bureaucratic thing, and community input is sadly overlooked. At any rate, my kids will not be the ones sacrificed to better the system. Isn’t expecting me to give them to the government at the expense of their future actually an even more selfish expectation? I feel that, by pulling my children out of their huge classes this year, the teachers have just a little more time to focus on the remaining kids. Everyone knows the schools are struggling, and part of the solution is,for those of us who can, to step in and help. I’ve taken two children off to the side to do this. My eleven year old is a fantastic reader, and in discussing what we could do to help the kids in public school, we’ve decided she will volunteer her services to read with kids. Teachers need to sit one-on-one with each kid and listen to them read, and that is hard enough for me with 2 kids! How can they do it with 20-30? My daughter is excited to go help, afterall, these are the people she will be sharing a world with! I was a single mom a short while back, and with no support from my children’s father, I had no choice but to put them in public school followed by affordable after school care. I had little time leftover to work with my kids, and they were falling behind. I had been a devoted stay-at-home mom, and was thrown to the sharks with my kids and suffered for it. Sorry to be dramatic, but my heart does go out for those who can’t do what I can do for my kids now…so while we should absolutely be free to decide how to educate our children, I do urge homeschoolers to find some way to share their blessings with others. No one asks childless people to have children just so their children can enter our broken schools and make it better. Why can’t we (like those without children) fight for better schools for other children while still providing a good education for our children. It breaks my heart when someone says that because I know their child’s needs aren’t being met and they are speaking from frustration and hurt (and usually a little bit of jealousy). People who’s kids are happy, well-adjusted, and on the honor roll don’t worry about home schoolers. That’s a really good point, Rebecca! Thanks for the point of view… That didn’t actually occur to me, but it makes sense. I just wonder what CAN be done to ‘fix’ things. How can they get what they need within that system? This actually sounds like the argument I get from my MIL when I talk about wanting to homeschool my kids. We should keep them there and fight for what they need so that future kids can get what they need. Um, that’s nice, but it’s at the expense of my kids. In a very difficult place right now and hoping to convince my husband to give homeschooling a trial run this Spring. Our public school does get a certain amount of money per child enrolled from the state, but I almost feel like we are doing them a favor. We are reducing class sizes making it hypothetically easier for the teachers. But as far as the rest of the money, we pay our property taxes like everyone else and therefore do support the local school. I wholeheartedly believe we should be able to choose what is best for our families. It is unfortunate that a few really bad apples may make it difficult to do that. However, I don’t believe in punishing those who are doing right because of the rare chance they could possibly do it wrong. I don’t think the government should be allowed to make us to things like put our kids in school or vaccinate-I don’t think they should be able to force us to put money into social security and such either. People need to be responsible and put money away for later. Anyhow! Sorry about the rant! Fortunately our local school has been nothing buy wonderful to work with. My kids play sports there and do extracurricular stuff. My son even got elected president of the senior class. So I am grateful for that! I have heard that argument for years. My oldest daughter is nearly thirty and my youngest child is only seven. I pulled my two oldest kids from middle school and high school to homeschool them because all those years I spent trying to be part of the solution had zero effect on the quality of our local schools. I didn’t even bother to enroll my youngest two children in the public school system, opting to homeschool them right away. Guess what? Our local public school system is still awful. The only guilt I have over this issue is that I made my two oldest attend public school as long as I did. I’ve actually heard a similar argument that really isn’t true. I was told that its’ not fair that I have pulled my kids out of public school, therefore taking $ away from our neighborhood school and that’s really unfair because we were in a “poor” area to begin with. I’m not getting any of the district’s money; it would be great, but it probably will never happen! And you are still paying the school taxes.